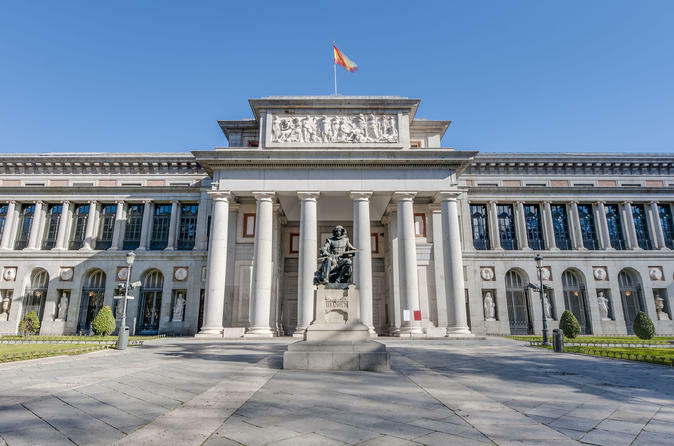 While you are visiting Madrid, you cannot miss Spain’s National Art Museum Prado, you will learn about the museum’s history as you walk around admiring the artwork with this private tour. While you are visiting Madrid, you cannot miss Spain’s National Art MuseumAt Prado, you will learn about the museum’s history as you walk around admiring the artwork. The Prado Museum is Madrid’s top cultural sight, and one of the world’s greatest art galleries; its dazzling display of works by the great European masters such as Velázquez, Goya, Raphael, Rubens, and Bosch (among other major Italian and Flemish artists), is housed in an 18th-century Neo-Classical building that opened as a museum in 1819. Its name derives from the district where it is located, formerly an area of market gardens known as the “prado” or meadow. The Spanish queen at the time had been impressed with the Louvre in Paris and wanted to showcase an enormous collection in her own country. The result is several thousand works at the present time, with a recent modern extension allowing more of them to be displayed. You can also choose the option that includes the Reina Sofía Museum, the most important museum of modern art that exists in Spain. Do not miss the oportunity of discovering paints from Picasso, Dalí o Miró. Learn how and why these talented people created their art and don’t miss the chance of getting essential information on this building, which will be provided by your guide.